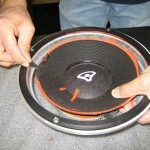 There is now a large selection of surround for your Do-It-Yourself speaker repairs. If the only problem with your speaker is that that the surround has been damaged, then you can replace the cone edge and rock on. You can watch a how to video and then order the parts you need from The Speaker Exchange. Tell us about the trials and tribulations of your repair and send us before and after pictures and we’ll post your successes for all to see. It is more difficult to get adhesives to bond to a polypropolene cone than to a standard paper cone. To deal with this, use a Very LIGHT grade sandpaper and scuff the edge of the cone that will attach to the foam to create a better bonding surface for the adhesives. 2. If you have a ring OVER the outside edge of the foam, remove it by inserting a utility knife or chisel under the gasket (do not remove any gaskets under the foam). Carefully pry around the gasket until it can be removed. You can reuse the original gasket or order new gaskets in most cases. Advent and Dahlquist Masonite rings can become brittle so be careful not to break them during removal. 3. 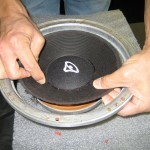 Scrape or peel the old foam from the speaker frame, cone, and the original gasket if you are re-using it. 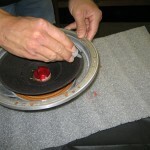 Remove as much of the old glue as possible without damaging or cutting the cone. (We do not recommend the use of solvents or other chemicals to remove the foam. They can damage the remaining parts.) Clean any old foam fragments left behind. 4. To better improve the success of your refoaming repair, we suggest that you remove the original dustcap– see FAQ’s. 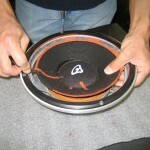 Do not remove dustcap for Infinity Bullet woofers or Bose 901 or 802’s- use eye, ear and feel to center foam). Keep the blade horizontal so you will not cut the cone or voice coil leads. 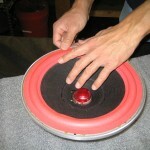 Slice center of the dustcap and work your way towards the outside edge and remove. 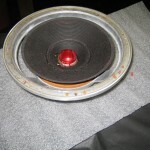 Use masking tape to remove any dirt that might be on the inside of the voice coil or in the voice coil gap. 5. 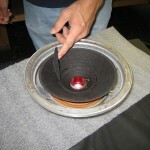 Insert vertical strips (about 1/8-1/4″ wide) of shim material inside the voice coil in between the voice coil and magnet pole piece to keep cone/voice coil assembly centered for the refoaming process. Insert at 12:00, 6:00, 3:00, 9:00 and evenly continue until the cone assembly is secure. Check to insure that the cone and spider assembly are at a natural height and not sunken or elevated. 6. 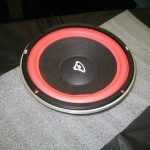 Dry fit the new foam on the speaker to check for proper fit to the cone and frame. The exact size foam might not be available so you may need to cut and seam the foam if it is slightly too large and/or trim the outside with scissors. When we refoam, we reglue the new foam to its original place, but you might find it easier to attach the new foam to the front of the cone if the original was adhered to the back. 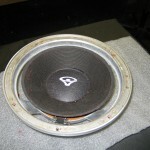 (Advent or Dalquist woofers with masonite rings must have the foam returned to the original location.) 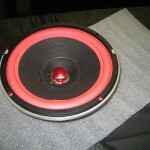 Technically there will be a change to the speaker, but it is unlikely you could hear any differences. 8. If you are using new gaskets, you might need to trim them to the correct size. Spread glue on gasket and when tacky, install. You can tape or clamp in position. If the gasket is taller than the foam, you can carefully turn upside down on a flat surface to dry. Do not slide, do not change alignment of foam or gasket. 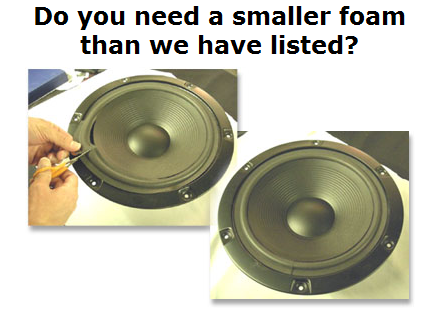 If the foam is taller than gasket, leave speaker face up and place same size component on top of speaker. Wait 24 hours and remove shims from voice coil. Lightly tap to test that cone moves up and down without scraping or grinding. Install new dustcap. If it is larger than original it will cover old adhesive markings.